and even my little tribe, who usually prefers the indoors, finds themselves outside in the sun a whole lot more. One thing my Mom was always super strict on with us was putting on sunscreen. So lathering my kids in sunscreen is second nature. In our family it is even more important because my oldest daughter has severe eczema and the steroid ointment she has to use thins her skins. Protection from the sun is an important part of our routine. It's not just for my kids. My husband and I also take the time to keep our own skin protected. Every face lotion I use has to have sunscreen in it, every day, all year long. Most face lotion products I use come with pretty low level of SPF. Anything with a high level of SPF tends to be thick and heavy. It can clog your skin and make you break out. So imagine how stoked I was to try out Neutrogena's "Clear Face" liquid-lotion sunscreen. This product gives you an SPF of 55 and protects you from both uva AND uvb and it super duper light weight. It also contains helioplex protection. Helioplex is a broad spectrum sunscreen technology that not just passes FDA standards, but exceeds them. You will see why this product will give you the ultimate protection without clogging your pores. Plus it is waterproof! 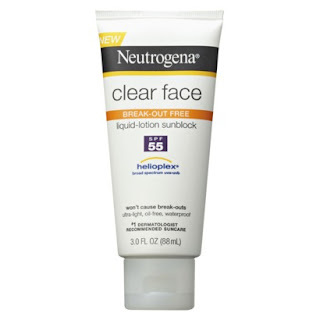 Clear Face is not the only great summer product Neutrogena has. You can see the full line HERE. The other day we were at a family pool party. A cousin was laying out in the sun determined to get a tan. I told her to make sure to put on a good sunscreen. She laughed and said..
"I'm Mexican, we don't get skin cancer"
And because I love her, I sent this to my cousin right away. thanks for educating other Latinas! It's so important to get covered up in sunscreen. Not to mention wrinkles that we can get!